When Satjit Wadva first contacted me and asked me if she could use two pieces I had written (I had written one for Times of India and another was in my book' 34 bubblegums and Candies' ) for a book on 'women' which she was editing and compiling, I was honoured. I readily agreed. But I had no idea at that time that the finished product would be so good! Last month she sent me not only that book but also her earlier book ' Life is Death is not'. Both books are beautifully hardbound and a delight to behold! (All book-lovers will know what I am talking about when I say that.) Both are non fiction. The first book (yes, my name appears on the cover page along with eminent writers like Taslima Nasrin and Khushwant Singh) is basically a compilation of deep, thought provoking pieces by different writers. All the pieces are well chosen. Satjit herself has written about the Dowry system in India and also another piece called 'Live Like a woman' which acts like a wake-up call and makes one think. The book also has a wonderful piece by Sam Levinson which was read by Audrey Hepburn and also has a poem by Wordsworth. Female foeticide is an ugly truth which India faces and is not only appalling but also heinous, unforgivable and unjustified to say the very least. It is a brutal crime and deeply pained by this, the publishers decided to come out with a book like this, which they felt was the need of the hour. 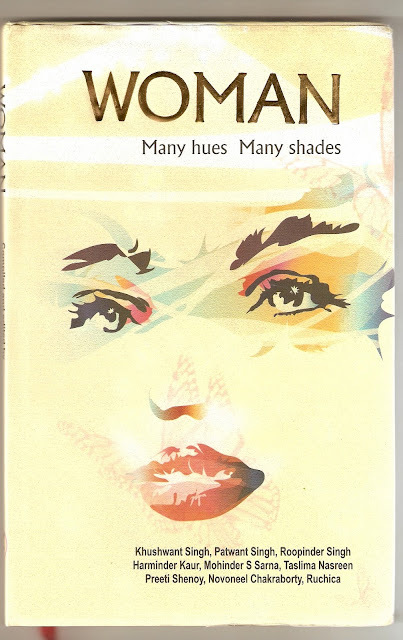 The back blurb of the book says "Woman--many shades, many hues captures the multifaceted phenomenon of a woman. It looks at how she is and how she has survived the stifling circumstances for centuries and yet come out not just alive, but vivacious and brimming with life." The book also contains some light hearted pieces. 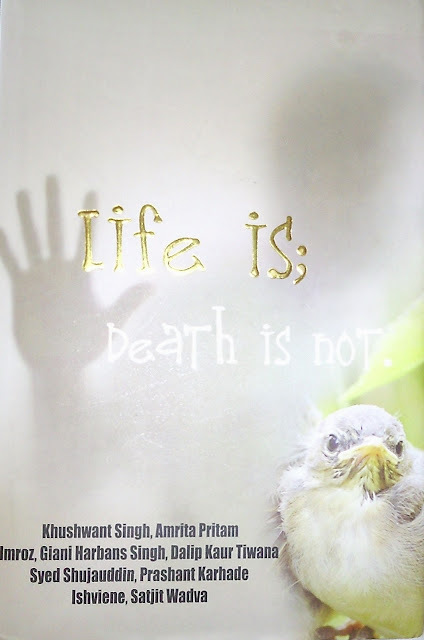 Satjit's other book, "Life is, death is not" moved me deeply. She says that death is something we all have to face one day, yet we avoid talking about it as it is considered morbid and depressing. This book is an attempt to understand and accept the inevitability of death. It makes us contemplate on death It makes us realise how important life is. The first part of the book (which I devoured) contains in a nut-shell what various religions say about death.The perspectives are enlightening. The second part has many pieces, again written by various eminent writers about their personal experience with death. Satjit's own piece "The deaths I have lived" moved me a great deal. I also loved her practical matter-of-fact approach in dealing with rituals associated with death.With writings from Kahlil Gibran as well as Amrita Pritam and Khushwant Singh, this book is truly 'wisdom in a capsule'. Both the above books are definitely not for 'light reading' but they leave a big impact on one. Thank you Satjit for sharing these two books with me. I am enriched because of the same. In case you want to buy a copy of these books, they cost Rs.295/- and Rs.300/- . You can get them directly from Satjit herself (e-mail her on satjitwadva@yahoo.co.uk) or from the publishers (email them on lahorebookshop40@rediffmail.com). It's lovely to see your name there! And, the books definitely sound like a must-read...u make a very valid point when u say "Death is something we all have to face one day, yet we avoid talking about it as it is considered morbid and depressing"
Amazing Preeti! It's a delight to see your name featured on the first book. I know I would enjoy reading both of these....any way of getting them here in US? I will look up Amazon myself but if you know, please let me know. If not, I will wait until I go to India end of this year :). Congrats Preeti....u must be so proud:-)!!!! Good thing u mentioned it here i'll definitely keep an eye out for it. Congratulations! You are really privileged to be listed with such famous authors.Keep up the good work! P.S This is third time I am trying to post a comment on this post just wondering what is going wrong? are these books available in india? any idea? Congrats Preeti.Both the covers and title are interesting..will try to read it..
Congrats Preeti!!! Its a dream come true!!! hats off!! U do deserve it!! Ilakshee: thank you so much! Sundari: Yes--both were good. available only in Punjab I think. Else one has to order them. Sandya: Already gave you link where you can get in US. Do ask your library to get it for you. Guru: Thanks :) Yes. Available very much in in India only. I think Chandigarh and Ludhiana and Delhi. You can write to Satjit. Vinoo: We already spoke on phone :) Bad bad blogger! Chandni:Thank you so very much. Your wors have always been kind and encouraging. God bless. Aathira: heheheh I remain me :) Thanks a lot! Reflections: Will visit you soon. Thanks!Blogger seems to be acting up. I'll make sure I'll grab a copy of this book soon, very soon! For a second, I thought this was your 2nd book. I guess we can take this as a prelude to whats about to come right ;-) Congrats Preeti. You must be very pleased & proud!! Congratulations, Pritj... am mighty pleased to see you grow in stature as a writer par excellence... seeing your name feature along with the virtual who's who of authors on the cover of the book, is definitely a feather(amongst many more to come!) on your cap to be exremely proud of!! Eagerly awaiting your next book! Also please wish Purvi a very very Happy Birthday from 'Uncle' Manish!! Here's wishing her all the happiness in the world!!! I am not those 'aunty mat bolo types' and love the fact that i am 32..but at the same time find 'kids' of the age of 27 and 28 calling me or anyone of my age aunty very ridiculous!! p.s: i am very sure that these books will be there in my shelf soon..! i love ur writings and i am one of your silent readers:-). 34 bubblegum and candies is a must book for every book reader's shelf! your writing has a simplicity which is hard to find these days in a world which is getting complex day by day!